The airfares, reported Tuesday by the U.S. Bureau of Transportation Statistics, do not include optional passenger fees such as charges to check luggage, pay for entertainment or to upgrade to a roomier seat. But the airfares did include mandatory taxes and fees. 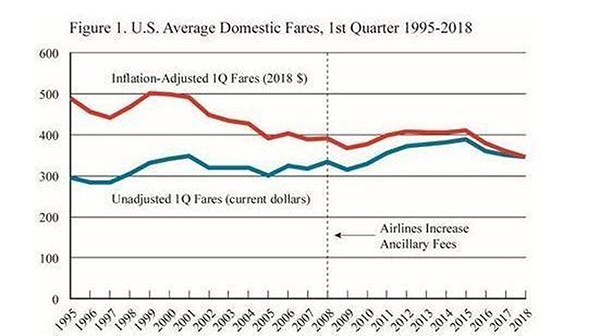 Airfares have been on a relatively steady decline since the end of 2014, and industry experts attribute the drop to lower jet fuel costs, the consolidation in the industry â€” thanks to a series of airline mergers and acquisitions â€” and competition from low-cost carriers including Spirit and Southwest Airlines. At Los Angeles International Airport, the average domestic airfare for the first quarter was $337, compared with the inflation-adjusted average of $350 during the same period last year, according to the bureau. But experts have warned that airlines may be forced to raise airfares soon to adjust for fuel prices that have increased 50% in the last year. They say that such increases are usually delayed by several months, until the higher costs begin to eat into company profits. But he noted that demand for air travel remains high â€” a sign that a hike in airfares probably wonâ€™t chase away too many passengers. In fact, on June 29 â€” the Friday before the Fourth of July holiday â€” the Transportation Security Administration reported that it screened 2.67 million travelers, the second highest number since the agency was created after the Sept. 11, 2001, terrorist attacks. Copyright 2018 Los Angeles Times. All rights reserved. From http://www.latimes.com. By Hugo Martin.